I was at a wedding earlier this week, and since it was down in the wilds of Wexford, I opted to hire a car to get me there and back. As a result, I had the chance to play with one of those driving options that I’ve never really tinkered with before: cruise control. It was an odd experience. On the way there, I switched it on, then off again after a few minutes, as the motorway to Wexford is only a motorway in parts. On the way back though, late at night and neither overtaking nor being overtaken between Gorey and Dublin, my speed changes all came courtesy of a switch on the steering wheel. When I drive, I drive manual, because it’s what I’m used to. The few times I’ve driven automatic, I’ve had to adjust to the idea of having a hand and a foot rendered more or less unemployed. Cruise control removes the need for the other foot. It’s terribly convenient, seductively easy to get to grips with and absolutely nothing like driving a car. Of course you realise, this means metaphor time. It’s not a wholly bad thing. Dial this desire to make our lives easier back to where it began and you’ll find yourself kicking the sharpened rock out of the hominid’s hand as it tries to turn an animal skin into something wearable. And yet, and yet, I resist it. I’ve written before about how Apple’s iPads have all but disappeared: they’re magic slates, on which appear a dazzling array of entertainments and utilities, designed to enhance our lives. Clarke’s Third Law comes into play here: we can still identify the iPad and its ilk as technology because we have to plug it in to the wall to charge, but its identifying marks are gradually disappearing. It’s civilisational cruise control of a sort. We create the items to ease our way through the world, thereby in theory freeing ourselves up to achieve all sorts of other things. Yet along the way, the vast majority of us forget or never learn how things work. From technology to politics to business, we’ve become accustomed to thinking that so long as someone understands it—someone whose job it is to understand it—then it’s their responsibility to deal with it. All we have to worry about are the results. We flick the switch to get from A to B and think no more about it. I’m far from perfect on this score, and it’s impossible these days to understand how everything works. Yet it’s worth making the effort to grasp the principles of the forces that move us, and have some ability to roll up one’s sleeves and shift them when the need arises. 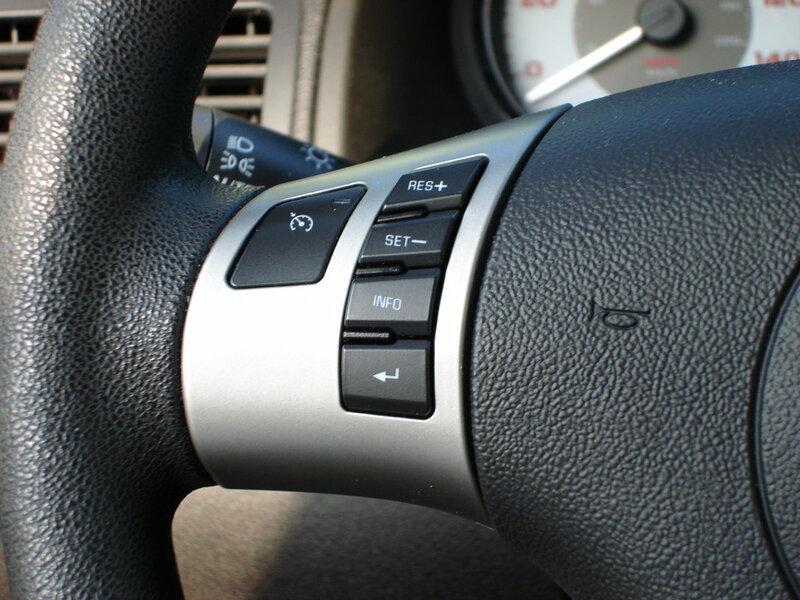 So I’ll keep on driving manual, and when I’m in a car with cruise control, I’ll think twice about flicking that switch. *Incorrectly, usually, but at least they’re trying. Early days on the French language tree. My several years of iPhone experience have seen me fall prey to a number of apps. Addiction to horticultural zombie escapades, miniaturised high-rise management and Indiana Jones-style sprinting have all proved fun, but I wouldn’t have called them beneficial. Well, now I may have found an app that is both addictive and good for me. Duolingo is a language-learning app, based on the web site of the same name. The concept behind the service is a simple one: crowdsourcing humanity’s efforts to learn new languages by getting them to translate web content. Because the learners are providing a service, the learning experience is free. Of course, having a free service doesn’t mean much if the experience is no good. Luckily, Duolingo’s app doesn’t fall down on that score. It sports a clean, colourful design that’s both welcoming and easy to understand. Each language is presented as a tree of connected lessons that users progress through at their preferred pace, from basic comprehension to complex concepts. 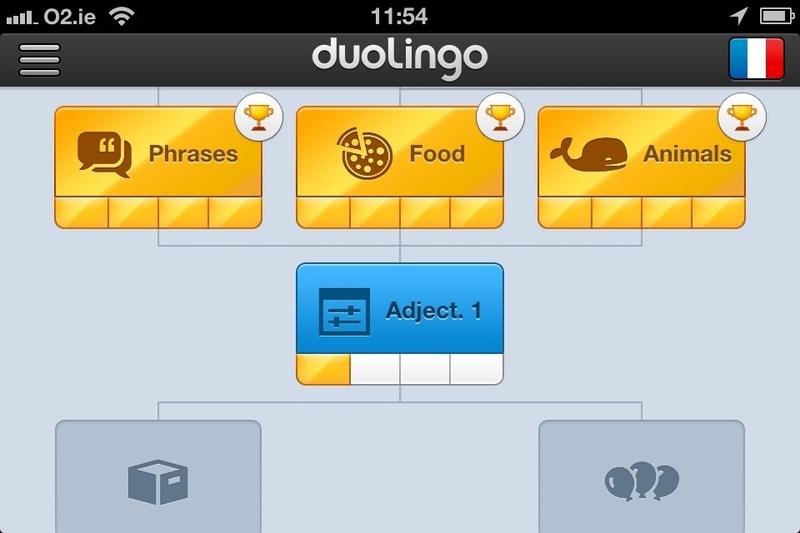 Lessons consist of 20 exercises, each taking no more than a few seconds to complete, with four or more lessons grouped into themed nodes (food, animals, adjectives, etc.) on the learning tree. As a barely competent reader of French, the early lessons in that language were a useful refresher for me, but if I’d wanted to jump ahead, each node offers the chance to “test out” and complete the whole thing in one short lesson. Gamification elements are put to good use here: users get three hearts per lesson, so they can make three errors before a fourth requires them to start over. Completing a lesson earns a users points and builds their in-app vocabulary, and the number of consecutive days they’ve been playing is recorded. The intelligence behind the app seems well tuned thus far, and will point out certain errors, like misplaced accents, but not penalise users for them. One of the big problems with learning a language (and maintaining that knowledge) is the issue of practice. Duolingo covers this too. First by offering users the chance to strengthen the skills they’ve already earned and second by providing a leaderboard so they can compare their acheivements with their friends. I can’t speak to the success of the latter as yet, but it’s another example of game mechanics intruding beneficially into the non-game world. The Duolingo app is comprehensive in its treatment of the five languages it covers (French, German, Spanish, Portuguese and Italian) and demonstrates a wealth of thoughtful touches in its design. One feature I’d love to see is a searchable vocabulary of words in each language, but as a relatively new app, there’s bound to be more to come from this initiative. This afternoon saw Apple’s latest media event taking place in an unusual venue for the company – New York – and without the oversight of the company’s late founder, Steve Jobs. The focus of the event was education, a subject that Jobs claimed was close to his heart, and although the event was very much U.S.-centric, the announcements made there have much wider implications. There are three main prongs to Apple’s education push: The first part is an upgrade to the iBooks application for the company’s iPad device in order to enable it to deliver media-rich, interactive text books for students in the U.S., focusing first on the high school level. The aim is to provide cheaper (assuming you factor in the cost of the iPad itself), more engaging, more up-to-date text books for students. That Apple has managed to get some of the main textbook providers on board already is undoubtedly due to the fact that if the technology company succeeds in turning the textbook market electronic, it will simultaneously kill the market in second-hand textbooks. Prong number two is the new iTunes U app. I’ve been using the iTunes University section of the iTunes Store for a while, as it has an amazing selection of free audio and video recordings of lecture series. The new app takes that idea to the next step, allowing educators to create and manage courses and deliver them to students. 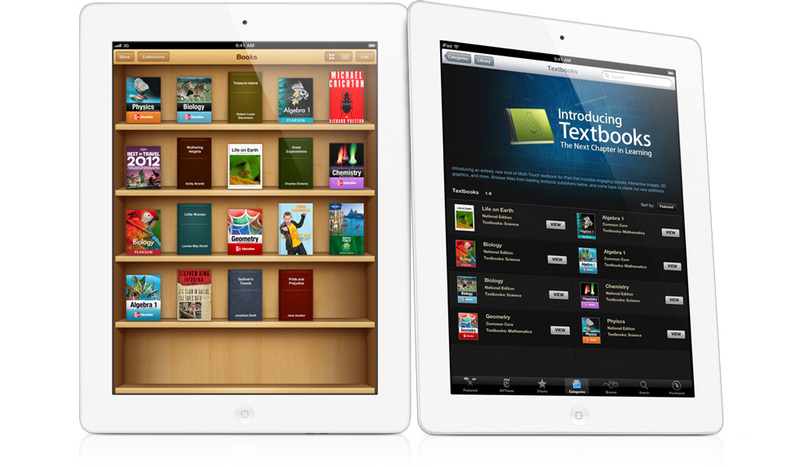 Together with the iBooks app, it’s nothing less than an effort to make tablet computers in general and the iPad in particular central to education in the U.S. And where the U.S. leads in this regard, the world is likely to follow. However, for me – someone who isn’t involved directly in education at the moment – the most interesting element of the announcement was the third prong: the iBooks Author application for the Mac. Although the focus at the event was on using this application to create textbooks, it’s clear that there’s much more potential here: iBooks Author allows anyone to put together rich media books, using video, audio, pictures and 3D elements together with text in an easy drag and drop environment. I’ve already downloaded it and am tinkering with it now to check out its capabilities, but already it’s reminding me a lot of a storied application from Apple’s past: Hypercard. If you don’t know what Hypercard is (and unless you used a Mac in the late ’80s, you probably don’t), you could take away a few elements of the above description of iBook Author and it would apply pretty well: Hypercard created stacks (read: ebooks) into which content creators could place audio, graphics and even video, linked together with a programming language that prefigured the HTML code of the World Wide Web. iBooks Author may not offer the same degree of interactivity and expandability, but the capability is definitely there, and the drag-and-drop creation is much easier. The ebooks sold through Apple’s iBook store may be called books, but they’re really standalone apps, designed to run on the iPad. They’ll deliver content first and foremost, but the manner in which they do so will be limited only by the imaginations of those who use the app itself. Of course, this being a brand new program from Apple, some caution is warranted. It’s already been pointed out that the EULA attached to iBooks Author may be overreaching itself. Similarly, Apple’s applications and devices tend to really hit their stride only when they reach the 2.0 milestone. Compare the original iBooks app, a polished but underwhelming competitor to Amazon’s Kindle, with the new textbook delivery system it has become. iBooks Author has a limited number of templates at present, and it will be a while before its users get to grips with what it can do. Already, however, I’m impressed with what I can see and am looking forward to playing with it and seeing the results.